The Henley Royal Regatta is one of the world's greatest rowing events. Every July, the world's top rowers head for Henley-on-Thames, west of London, for the Henley Royal Regatta. 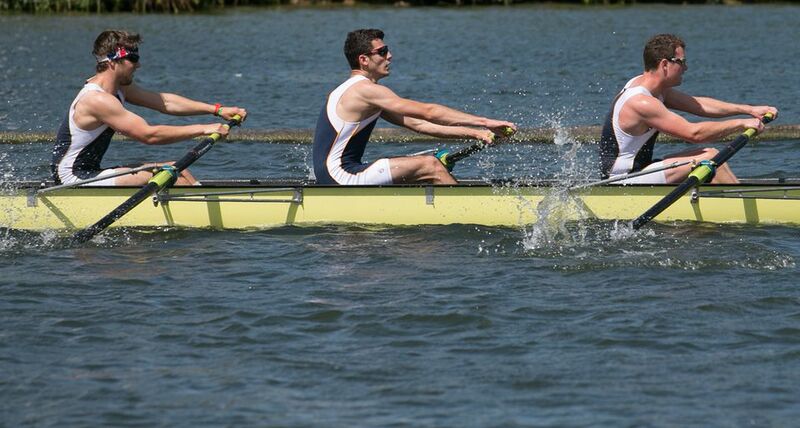 International university crews, rowing clubs, and Olympic rowers from all over the world pit their skills against each other in head-to-head, knock-out heats on a stretch of the Thames along the Buckinghamshire - Oxfordshire border. Meanwhile, spectators eat strawberries and cream, drink Pimms, and admire each other's outfits. And to think, this anchor of the English sporting social calendar started out as a publicity stunt to attract tourists. In 1839, the mayor and people of Henley-on-Thames introduced a July rowing race as part of a fair to attract fun seekers to the town. You've got to hand it to those local boosters. They started one of the world's great rowing events for rowing crews and individual, club, school, and university rowers. With the exception of the years of the two World Wars, the Henley Regatta has taken place ever since, growing from a one day, local event to a five-day rowing meet attracting top international crews and champion athletes as well as thousands of spectators. This event fixture is unique in crew rowing events. Because it started long before national and international rowing federations were formed, it has its own set of rules. And, although it isn't subject to the jurisdiction of the Amateur Rowing Association in England or the International Rowing Federation (FISA), it is officially recognized by them both. Rowing at Henley is head-to-head. The races are organized in knock-out draws with only two boats racing the one mile and 550-yard course in each heat. That makes for a lot of racing, with as many as 100 races, each taking about 7 minutes, per day. There are a variety of classes and combinations for men and women - eight and four-man, coxed and coxless, coxless pairs, doubles and quadruple sculls, and single sculls for men and women. Athletes include Olympic hopefuls, club rowing crews, school rowing crews, and university rowing teams. They come from everywhere. In recent years, international rowing crews have arrived from Australia, Canada, Croatia, Denmark, France, Poland, the Netherlands, the U.S.A., Germany, the Czech Republic, Ukraine, South Africa, and Great Britain. Every year more than 100 crews are from overseas. Which rowing crews or individual rowers race against each other in the heats is determined after a series of qualifying races about a week before the regatta begins. Crews that qualify are then entered in a public draw at the Henley-on-Thames town hall. There are two "Enclosures" or viewing areas for watching the race. Since the Regatta owns most of the riverbank and parking area on the Oxfordshire side and some of it on the opposite Buckinghamshire side, you really do need to buy a ticket to see the race. The regatta is managed by a self-elected body known as the Stewards. There are 55 of them and most are well-known rowers and scullers. The Stewards' Enclosure is the area of riverbank closest to the finish and is for the use of the Stewards and their guests. In practice, a certain amount of corporate hospitality and charitable donation makes tickets to this enclosure occasionally available. Parking for this enclosure is separate from the general parking and closer to the grounds. The dress code enforced inside the Stewards' enclosure calls for suits or blazer and flannel trousers for men. We wondered whether the dress code for women had loosened up a bit in 2018, but not a chance. It's below-the-knee dresses, no trousers, culottes, or divided skirts. While hats are not required, most women wear them. This is one of England's big hat wearing events. The Regatta Enclosure is open to non-members. Athletes taking part, along with their supporters, often watch from here. Anyone can buy a ticket to the Regatta Enclosure. Tickets are sold in advance technically up to the last week in June - but in practice, they usually sell out by late winter. After that, they are available on a first come, first served basis, at the gate. If you arrive early, you can usually get a ticket for the Regatta enclosure - though you may not be able to get in for some of the major challenge races on the Saturday of the Regatta. There is no dress code for the Regatta Enclosure but people usually dress up here as well. The enclosure has catering facilities, bars, unreserved seating, and restrooms. Turn it off. We know that may be hard but, if you are invited to the Stewards' Enclosure and you are caught talking on a cell phone, you will be asked to stop and your badge number will be taken. That's to ensure that the responsible member gets notified (and embarrassed). If you are caught using a phone a second time, you will be escorted out of the enclosure. From the M4 motorway, exit at junction 8/9 onto the A404 and follow the signs to Henley. Take the third exit off the A404 onto the A4130 into Henley. If you are able to book your tickets in advance, book your parking for the Regatta Enclosure at the same time. Otherwise, parking, like enclosure tickets, is available on a first come, first served basis. There are several grades of parking passes and those closest to the main enclosures cost the most - sometimes more than the enclosure tickets themselves. By train: The train is definitely the smart way to get to Henley. Besides, the train will be packed with others heading to Henley and it's fun to look over the clothes and hats everyone is wearing. The journey takes a little over an hour and the train station is about five minutes south of the center of town. Once you arrive, just follow the crowds and the signs to the river. Trains to Henley-on-Thames leave regularly from Paddington Station in London, with connecting service through Twyford or Reading.